Omega offers a variety of hardwood in various species for your next project. 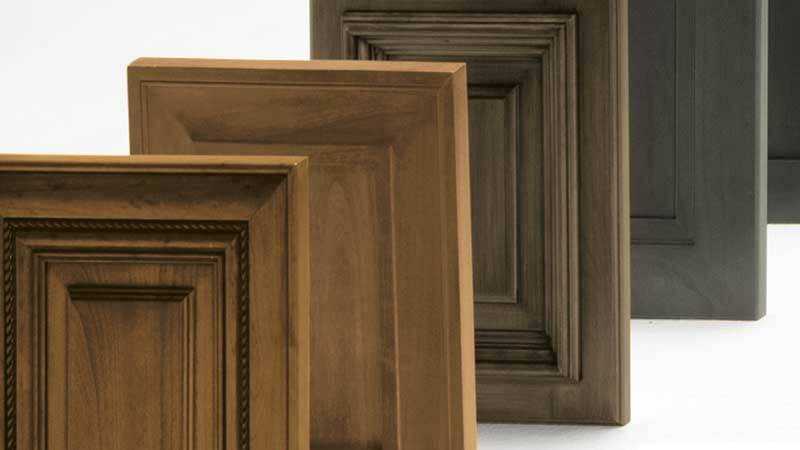 Learn more about our cabinet wood types and determine which is right for your home. Alder cabinet wood features a straight, fine textured grain, similar to Cherry and Maple. In its natural state, Alder features a fairly uniform hone color, and sapwood can be distinguished from heartwood, with tight pin knots present occasionally. Classified as a hardwood, Alder is moderately light in weight and is considerable softer than other Omega hardwood species, allowing it to dent and mar easily. Rustic Alder is also available. Cherry is a smooth, even-grained hardwood known for its warm, rich character. Heartwood can range from deep red to reddish-brown color. In its natural state, Cherry cabinet wood may have areas that are yellowish, green, and even gray. Cherry "mellows" and darkens with age; exposure to bright or direct sunlight will cause wood to darken and redden significantly. Cherry will have some sapwood, mineral streaking, fine pin holes and pitch pockets, which are all natural details that add to the beauty of Cherry wood. Rustic Cherry is also available. Maple cabinet wood is characterized by its smooth, even, and fine grain pattern. Natural Maple has some color variation but is generally more uniform than most hardwoods. Mineral streaks are common in Maple and appear darker when stained. On darker finishes, a distinct mottled look is apparent when a stain is applied. One of the stronger hardwoods, Northern Red Oak is known for predominant grain patterns that run from straight lines to arched and pointed variations. Light and dark contrast is noticeable on natural and light finishes. Rustic Oak is also available. Known as one of the stronger hardwoods, Pecan is characterized by dramatic color variations ranging from white sapwood to reddish brown heartwood — even on the same piece of wood. As Pecan ages, it will "mellow," making the color variation less apparent. Expect to see pin holes, knots, burl and color streaks in Pecan, and due to variations in wood, expect that some cabinet parts will have fewer characteristics than others. Quartersawn Oak cabinet wood is cut from white oak trees and features finer grain patterns due to the way that the actual cuts are made on the log. Cutting at a 90 degree angle from the growth rings on an Oak log, producing a vertical and uniform grain that results in a beautiful look representative of Stickley and Mission styling that is currently in high demand. Walnut features smooth grain with rich, warm appeal. Color can range from deep chocolate to light reddish-gray brown. Sapwood areas will range in hues from light yellow to light brown. As Walnut ages it will "mellow" and lighten in color.